An Egg-Adult Association, Gender, and Reproduction in Pterosaurs. 2011. Junchang Lü, et al. Science 331: 321-324. 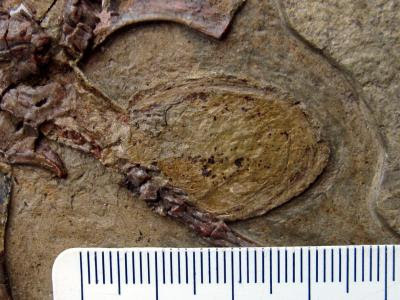 A specimen of the pterosaur genus Darwinopterus preserved with an egg links gender with sexually dimorphic characters. The new discovery, christened "Mrs T" (a contraction of "Mrs Pterodactyl") by the research team, was made in Jurassic rocks of Liaoning Province in northeast China and seems to represent a tragic accident. The well developed shell shows that Mrs T was just about ready to lay her egg (below) when she was killed in an accident that broke her left forearm, possibly the result of a storm, or perhaps even a volcanic eruption, which were common in this part of China around 160 million years old. 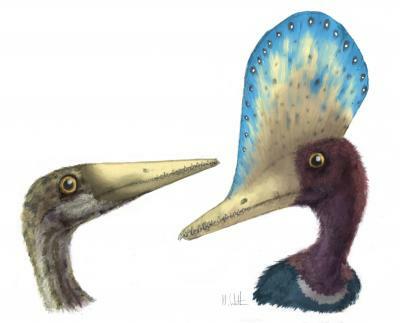 The fossil shows two features that distinguish it from male individuals of Darwinopterus. She has relatively large hips, to accommodate the passage of eggs, but no head crest. Males, on the other hand, can be assumed to have relatively small hips and a well developed head crest. The egg is relatively small and had a soft shell. This is typical of reptiles, but completely different from birds which lay relatively large hard-shelled eggs. This discovery is not surprising though, because a small egg would require less investment in terms of materials and energy – a distinct evolutionary advantage for active energetic fliers such as pterosaurs and perhaps an important factor in the evolution of gigantic species such as the 10 meter wingspan Quetzalcoatlus."